Kathmandu as she swept by me after evening devotions in the nunnery. Pausing at the bottom of the stairway to her quarters, she turned and, bright black eyes locking with mine, added, “Will we meet tomorrow? The buses leave at six“-an order, not an invitation, I realized, and so, putting my life on hold, the next morning [I joined the pilgrimage]. Sarah LeVine began doing research in Africa in 1969 as a young woman and sometime Anglican newly married to an anthropologist and provisionally, at least, to a rationalist view of religion. Over the next several decades, as she continued her research in cultures as various as Muslim Nigeria, Catholic Mexico, Buddhist Nepal, Hindu India, and New Age America, she honed a keenly observant eye. During this time she also raised two children, learned and forgot many languages, wrote highly praised novels (under the pen name Louisa Dawkins), and began to understand that religious faith has little to do with doctrine or philosophical abstractions. These deftly crafted accounts plunge us into the lives of some of the people LeVine became close to on four continents. In a northern Nigerian town we find orthodox Muslims trying- and failing- to ignore the thriving spirit possession cult in their midst. In a Mexican city women struggling with their husbands’ infidelity and the loss of children and take the Virgin Mary as their role model. In the face of tragedy in a Kenyan village, tensions flare between traditionalists who live in dread of ancestral wrath and witchcraft and Christians who reject such beliefs. 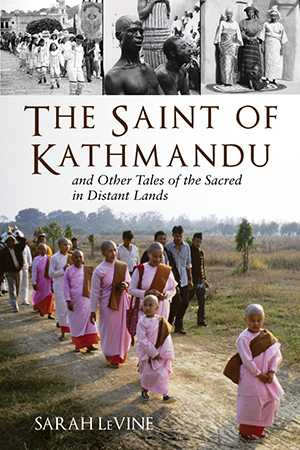 In affluent Hong Kong a Filipina maid, enduring a long separation from her son, turns for support to a charismatic Catholic church; and in Nepal, LeVine accompanies the remarkable Saint of Kathmandu, who fled an arranged marriage and earned renown as a Buddhist nun and feminist leader, on a pilgrimage to holy places all across north India. These lives led LeVine to think of religion as inseparable from cultural complexity and constraints, and to view less critically her own lingering attachment to what she calls The Life of Christ (The Movie). As engrossing and surprising as any novel, The Saint of Kathmandu is a richly textured and unsentimental depiction of the role of religion in lives all over the world. "What Sarah LeVine found as she traveled the world researching and becoming close to the people of four continents is that in facing the full range of human emotions, orthodoxy in belief and practice may not be a match for people's traditions in bringing them hope and comfort." "An interesting book with an interesting perspective. There are things here both positive and negative about all these various groups and religions . . . It's a good read, and it's fun to visit the unusual cultures and share the odd experiences the author relates with us here." "A compelling book, and it's compassionate without condescension." "With her 'observing eye' and boundless curiosity, LeVine describes how witchcraft, Buddhism, spirit possession, charismatic Christianity and the Virgin Mary help people make sense of their lives and endure the hardships they encounter. Vivid descriptions and symapthetic portraits are this book's strengths."